I made this baby spinach salad inspired by one I had in a restaurant. It is simple but yet not too basic. 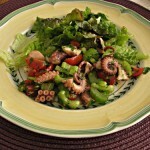 Only four ingredients and some dressing! 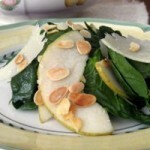 Baby-spinach, pear, toasted almonds, and parmigiano.